CEOs at BT's lunch meet in New Delhi discuss the FDI dilemma facing India. Mixed feelings: (Standing, from left) Philips Capital India's Chhitiz Kumar, Boeing India's Pratyush Kumar, Business Today's Josey Puliyenthuruthel, Rahul Khanna of Canaan Partners, and Rohit Bansal of Snapdeal (Seated, from left): Amar Sinha of Wave Infratech, Kashmiri Lal of Swadeshi Jagaran Manch, Shachindra Nath of Religare Enterprises, and WD India's Subroto Das. There was a surprise element at Business Today's CEO Lunch held on the 20th floor of the Le Meridien hotel in New Delhi on August 4. The topic of the discussion - moderated by Josey Puliyenthuruthel, Managing Editor of BT - was India's FDI Stance: Free or Calibrated Approach to Opening Up? And amid a gathering that included seven top industry honchos, was a unique guest - Kashmiri Lal, National Coordinating Secretary at Swadeshi Jagaran Manch (SJM), the economic wing of the Rashtriya Swayamsevak Sangh. The new Narendra Modi-led government has announced plans to increase foreign direct investment (FDI) in sectors such as railways, insurance and defence. Over lunch, which lasted close to two hours, well beyond its stipulated time, Lal talked about how he would rather shut down companies such as US agriculture firm Monsanto and retail giant Wal-Mart than allow them to open shops. "If I ever become a dictator, I will shut down Monsanto... We should close down 'sharks' like Wal-Mart." Kashmiri Lal, National Coordinating Secretary, Swadeshi Jagaran Manch. Indeed, Wal-Mart has had a rough ride in India. It had to close its joint venture with Sunil Mittal's Bharti Retail. Wal-Mart, in fact, bought back Bharti's 50 per cent stake in their JV and is now on its own in the cash-and-carry business. But without 100 per cent FDI in multi-brand retail, Wal-Mart cannot open retail stores such as the ones it has back in the US. SJM, meanwhile, has in the past and recently opposed FDI in the country. Lal, however, was not entirely against it, saying that the government should bring out a 'white paper' on the subject. "The government should look at the past 20 to 22 years of FDI and see how it has impacted the nation." On a lighter note, Lal's presence led a panellist to whisper: "I should think twice before speaking." Shachindra Nath, Group CEO at Religare Enterprises, a diversified financial services group, had some disagreements with Lal but he did agree that FDI should not be allowed in retail immediately. "India will be ready for FDI in retail in 20 years." Nath said that India, unfortunately, does not have the domestic pool of capital needed for overall growth. "Hind Swaraj (Indian Home Rule) cannot be implemented. To feed our country we need FDI," said Nath, adding that Indian companies don't have the money, and neither does the government. Ninety per cent of the companies in India, in fact, are debt-ridden, suggesting that FDI is the only way to flow money in the hands of the people and companies. FDI should be used to grow entrepreneurship in the country, added Nath. 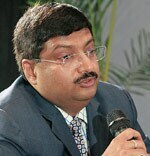 Pratyush Kumar, President, Boeing India. FDI clearly seems to be important for the country, feels India Inc. "The world needs India to succeed. China and the US are slowing down," said Rahul Khanna, Managing Director at venture capital firm Canaan Partners, adding: "... Private sector has done a great job where the government has failed." SJM's Lal intervened, saying: "Nobody gave us the super computer. Finally, we built it. Nobody gave us nuclear technology, we developed it... There has been more outflow of funds, at $31 billion, than inflow, which was $26 billion. We need to relook at FDI." As far as FDI in retail goes, there were a few apprehensions. "Not allowing FDI in multi-brand retail perhaps is a good decision, which protects smaller businessmen," said Amar Sinha, Executive Director at Wave Infratech, the real estate arm of the Wave group. There was a heated debate on FDI in the defence sector. Pratyush Kumar, President of Boeing India, which manufactures and supplies defence products and services, said the sector should be completely opened up. "Capital chases returns... The defence sector has become so capital intensive that no country can do it on its own, not even the US. If (FDI) is done smartly it can bring a lot of potential to us," he said, adding: "Up from 26 per cent to 49 per cent is the step in the right direction." Even Lal admitted that FDI was needed in defence. 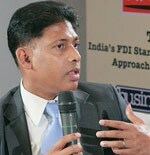 Shachindra Nath, Group CEO, Religare Enterprises. Meanwhile, aggregate FDI inflow has gone down in the last five years, a worrying sign for many sectors. "Health-care and education also need FDI, beyond defence. You need to let companies come and settle down in India. You need to let them build their manufacturing base," said Chhitiz Kumar, Head - Philips Capital India and Government & Public Private Partnership (PPP) Business. For Subroto Das, Head of WD India, a global storage company, FDI will help create more jobs and bring in more technology into the country. "You don't have a choice. FDI is a reality. It is about the pace of implementation." Das, however, did mention that China has very strict FDI regulations. Technology transfer, for instance, has to be done, which benefits the country. Rohit Bansal, Co-founder and Chief Operating Officer of Snapdeal, India's biggest online marketplace, said that FDI should be used in such a way that it creates the right balance between creating jobs and helping consumers. "The government has to think a lot before allowing FDI in a sector." The last comments were reserved for Lal. "FDI is a part (of growth) and not the overall growth." For Lal, the inputs at this event will definitely come in handy as he starts preparing for 'Swadeshi Sangam', a two-day convention organised by SJM. To be held later this year, it will discuss government policies on various issues, including FDI, and influence public opinion. 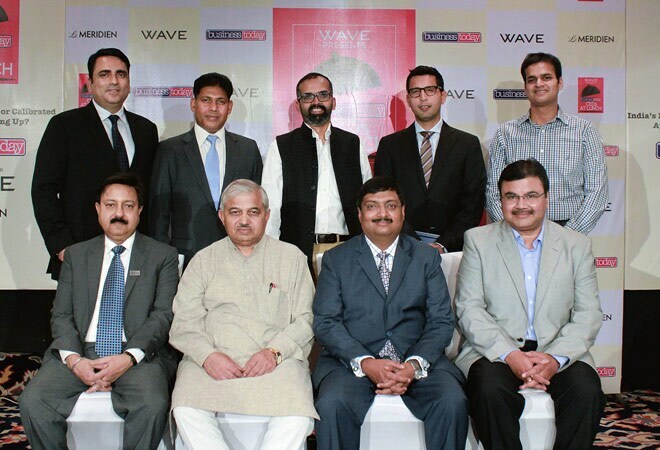 The event was sponsored by Wave.